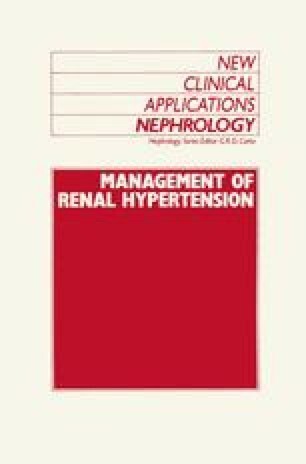 Renovascular hypertension, which probably accounts for between 1% and 2% of an unselected hypertensive population1, not only constitutes the dual threat of severe hypertension with its complications and progressive renal insufficiency, but may also be a marker of widespread vascular disease. Until recently, the therapeutic options were limited to medical treatment with antihypertensive drugs, reconstructive surgery, or nephrectomy. Conventional drug therapy often proves inadequate for the optimal control of hypertension associated with renovascular disease, while polypharmacy and unwanted side-effects contribute to poor patient compliance. The introduction of angiotensin converting enzyme inhibitors provided a means of effectively controlling hypertension in most patients with renal artery stenosis2,3. Successful medical therapy, however, was associated in some instances with a decrease in renal function4,5, and patients with bilateral renal artery stenoses or severe stenosis in a solitary functioning kidney ran the risk of developing acute oliguric renal failure6,7.